Financial statements audit, review and related services. Audits for European Union and other structural funds financed projects. Complete financial accouting, declaration and related services. Consultation on financial and management accounting, taxes, projects management, accounting and control related questions. Preparation of documents related to company’s activity. Declaration of personal income and asset. Over than 20 years with YOU! 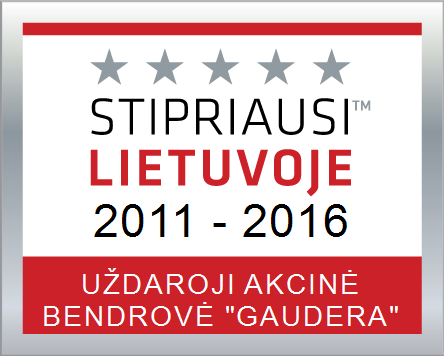 Private company “Gaudera” is established in 1995. The company was included to the list of auditing companies in 2002 according to the order from the Finance minister of the Republic of Lithuania. Main principles of work at “Gaudera”: Quality, Professionalism and Effectivity of the services we provide. Our clients are business companies, public organizations, education organizations, budget institutions, private persons all across Lithuania and abroad. Company‘s main activities are financial statement audit, auditing and consulting of projects financed by structural funds, financial accounting and consulting. Company employs 9 employees, which two of them are certified auditors. The rest of employees have academic degree in finance, accounting or management fields; have sufficient practical experience to perform given tasks. Personnel regularly attend seminars, conferences and various courses in order to improve their professional skills. UAB “Gaudera” has insured the activity by the insurance of professional responsibility and the obligatory insurance of civil responsibility of the audit companies. UAB „Gaudera“ is a correspondent member of the network Russell Bedford International. If you have any question, just write to us and will contact you immediately!